The volleyball transfer of the century in England has materialised. A current World Champion, an Olympian, a representative of numerous events and Champion of Poland Krzysztof Ignaczak will play for reigning English Champions IBB Polonia London for the rest of the season. The Londoners can expect huge support and marketing opportunities when the very popular “Igla” (eng. “The Needle”) arrives. – I had already retired, but thanks to President Luszcz amongst others, I have decided to return to training. The work that the players and back-room staff have carried out at IBB Polonia London deserves to be recognised. The guys train hard, and for the love of the sport are building something phenomenal in England; a country where our sport isn’t very popular. I want to support them in the only way I know how: I think a team can be built in London that can win European trophies. I had always wanted to play overseas, and now I have the opportunity. – said Krzysztof Ignaczak. Ignaczak will arrive in London at the start of the next month to meet the Team and to prepare for the semi-finals of the English Championships on 22nd and 23rd April. 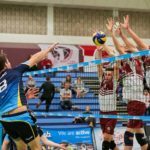 The World Champion aims to make himself as accessible as possible for everyone who wish to develop English volleyball. There will be meetings with fans, media and sponsors. – We anticipate a huge level of interest in our Club and our sport thanks to the transfer. I am sure that this season we will be playing in front of sell out crowds. Mr Ignaczak is such a popular person, that apart from playing he is also a journalist, commentator and blogger: he is one of the most popular sportspeople in Poland. As a consequence, I am sure that his presence will push English volleyball forwards and be a huge asset for marketing it. – said Club President of IBB Polonia London Bartek Luszcz. The players are looking forwards to meeting their new team-mate and will welcome him to the squad with open arms, but also as rivals within the team. For people who juggle work commitments around their volleyball dreams it will be a great pleasure to have him on board. An interesting idea is that Head Coach – Piotr Graban is considering playing him as receiver, so the return of Igla at this position is an exciting prospect. – He is technically outstanding, and could potentially play every position on court. I’m thinking about receiver as his primary role and he will show us what he can do as an attacker. My players are working very hard, to show him that they can also play volleyball. It’s not going to be easy, but I am looking forward to seeing the intense rivalry for the places on court. – said Head Coach Piotr Graban.